The smart world-class city, one of the most beautiful, organized and clean cities in the Middle East, one of the most important seven emirates of the UAE and the second largest city in the country. It is located on the southeastern coast of the Arabian Gulf. Dubai is considered among the most attractive Arab cities to tourists annually. It is getting ready to host the International Expo event in 2020, which is held every five years in a world-class city that is voted on. The event attracts millions of visitors across the world. By hosting this global event, Dubai will be the first Arab and Middle East city to host this huge global event. Dubai is a world-class city par excellence, as two-thirds of the world’s population can reach it within eight hours by plane through Dubai International Airport, one of the world’s largest and most luxurious airports. That airport is also one of the world’s top ten airports and the fastest in growing with a capacity of 90 million passengers per year. Dubai has a huge transportation network that is characterized by safety and comfort. It also conjoins a large number of hotels, busy with serving and providing comfort to the clients, and also conjoins hundreds of Arab and international restaurants, and many shopping centers, complexes, recreation centers and medical resorts. Dubai attracts annually more than 14 million tourists from Arab, European, American and Asian countries, due to its global reputation of security. It has many attractions and distinctive entertainment places as well, including the Heritage Village, which contains many cultural attractions of diving and fishing, and it is a unique window to learn about the history of diving and fishing in Dubai and reveals important aspects of the history of the country. Also there is Sheikh Saeed Al-Maktoum ancient house, which attracts many tourists every year, where they can learn about the life in the house of the Ruler of Dubai in the first half of the 20th century. Also, they can visit many ancient houses and distinctive museums, such as the Dubai Museum, the Hawks Museum, the Museum of Coins, the Horse Museum, Traditional Architecture Museum, the Museum of the camel, the historic Alfahidi Fort, Hatta Heritage Village, Hatta Fort, the Ahmadiyya school and other heritage sites and museums. Dubai is the first skyscraper city in the Middle East and the Arab world, with a huge number of skyscrapers and world-class luxurious buildings including Burj Al-Arab, one of the world’s most luxurious hotels, Burj Khalifa, The world’s highest building built by humans with a hight of 828 meters. There is also the magnificent city of Jumeirah, which has been built along the sea, where you can find the best entertainment and shopping centers as well as the restaurants, in addition to other places and landmarks including the famous International Village, which is one of the wonderful entertainment places with its diverse activities. Dubai Media City is another landmark beside the Dubai Car Racing Track, the impressive Merkel Garden Park containing 45 million flowers, the Dancing Fountain, the wonderful Creek Park overlooking the skyscrapers of Dubai. Water sports enthusiasts can enjoy kitesurfing and other water sports at Kite Beach. They can also enjoy the marine cruises and stunning beaches. On the other hand, skydiving enthusiasts can enjoy balloon trips and skydiving, too. Also, there is plenty of thrill and adventure waiting for skiers in Ski Dubai. Besides, Dubai provides unforgettable safaris in its desert. Also, you can wander through the room of Atlantis to discover the secrets of the lost continent and dive into the depths of the most exciting adventures. You can also try a helicopter trip or a water jet from Marina. Dubai has many local markets such as Mirshed Market, Madinah Market, Rashidiya Market, Hatta Market, Deira Gold Market, Jumeirah Markets. The city is also the hub of the largest and most luxurious malls in the UAE and the Middle East. These malls open their doors to visitors throughout the week, such as Mall of the Emirates, Dubai Mall, ibn Battuta Mall, Festival City Mall and many others. 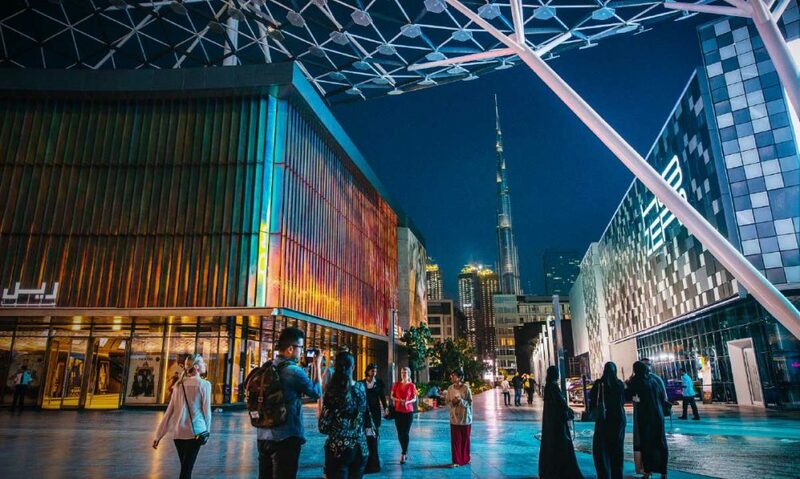 Dubai is also famous for its global shopping festival which is held annually and attracts thousands of visitors, making the city a leading shopping destination in the region and the whole world. Dubai has 6,000 restaurants offering international and Arabian cuisine for tourists and residents as well. Many of them are available 24 hours a day. Among which is the Atmosphere Restaurant, the world’s highest restaurant, where you can enjoy a sumptuous dinner.